UN CHIEF BAN Ki-moon has urged “bold” actions by countries around the world to reduce greenhouse emissions and fight global warming. “I am asking them (world countries) to announce bold commitments and actions that will catalyse the transformative change we need,” said Ban at a ministerial meeting in Abu Dhabi to prepare for a September 23 climate change summit in New York. “If we do not take urgent action, all our plans for increased global prosperity and security will be undone,” he warned representatives of UN member states meeting for two days in the Emirati capital. The latest scientific assessment of the UN’s Intergovernmental Panel on Climate Change, released in phases, states that humankind still has a chance to limit warming to relatively safe levels, but warns of dire consequences otherwise. The longer we delay, the more we will pay. The UN seeks to hold warming to below two degrees Celsius (3.6 degrees Fahrenheit) above pre-industrial levels, at which scientists believe we can still avoid the worst effects of climate change. 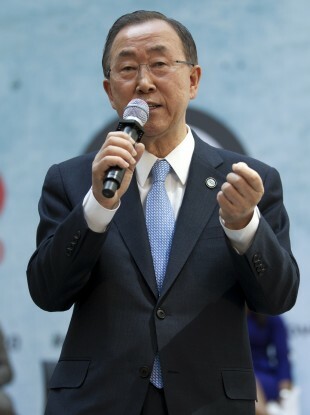 “The UN top priority at this time is to make this world sustainable not only commercially and socially, but environmentally,” Ban told reporters. Ban will host heads of state and government in New York in September to “catalyse action” ahead of a meeting in Paris at the end of 2015 where the world’s nations are due to sign a global climate pact. The deal, which must come into operation by 2020, should outline emissions curb targets – a controversial issue that has been the topic of years of often belligerent talks. Email “Delay on climate change action? We'll pay for that, says UN chief”. Feedback on “Delay on climate change action? We'll pay for that, says UN chief”.